What is bare fiber PLC splitter? Bare fiber PLC Splitter features low insertion loss and Polarization Dependent Loss, Excellent Environmental Stability and Mechanical, Stability Telecordia GR-1221 and GR-1209 Components through TLC-Certified, Conform to YD1117-2001. Also, bare fiber PLC splitter can be used in FTTX, FTTH, PON, GEPON, LAN，CATV and Test Equipment. Bare fiber PLC Splitters include 1*N PLC splitter module and 2*N PLC splitter module. The common configurations are1x2, 1x4, 1x8, 1x16, 1x32, 1x64 and 2x2, 1x4, 2x8, 2x16, 2x32 bare PLC splitters. We can also provide special configurations and demands. What is blockless PLC splitter? Blockless PLC splitters are available in different types like 1x4, 1x8, 1x16, 1x32, 1x64, 2x4, 2x8, 2x16, 2x32 Blockless Fiber PLC Splitter. The splitters connectors can be FC,SC,LC, etc. Blockless PLC splitters are with compact stainless tube package, they are important products used in FTTx projects. Blockless PLC Splitter works with single mode fiber at wavelength range from 1260 to 1650nm. SOPTO Blockless PLC Fiber Splitters are low insertion loss and good stability, with Stability Telecordia GR-1221 and GR-1209 Components through TLC-Certified, Conform to YD1117-2001. These splitters' working temperature is from -40 to 85oC. Other PLC splitter like Bare Fiber PLC Splitter and PLC Splitter with Fan-out are also available at SOPTO online B2B shop. PLC splitter with fan-out is mainly used for 0.9mm optical fiber where the ribbon fiber can converted to 0.9mm optical fiber through fan-out. Fiber adapters can be provided both for the input and output ends of this kind of splitters so that they can be used directly to meet the low demand on the size of the splitter. We provide PLC Splitters features low PDL, low excess loss and insertion loss, and high reliability that meet GR-1209-CORE and GR-1221-CORE requirements. This is normally an option with fiber distribution cable, or sometimes loose buffer or ribbon cable. It is designed for a permanent termination. SOPTO provides whole series of 1xN and 2xN PLC Splitter w/Fan-out kits. Get more PLC splitter from us! Plastic ABS box PLC Splitter includes 1*N PLC splitter module and 2*N PLC splitter with plastic ABS box. Because that Plastic ABS box PLC Splitter is ABS heat-resistant engineering plastics material produced by their chemical composition material, so it has small compact, corrosion resistance, high temperature resistance, high strength and toughness, it is often used in the manufacture of plastic casing of the instrument. On the Planar waveguide optical splitter, the role of Plastic ABS box is to protect the PLC Splitter to suit our different installation environments and installation requirements. We provide variety of PLC Splitters in form of standard LGX metal box, the PLC splitter products are terminated and/or pluggable. The standard LGX metal box features small compact and flexible configuration. LGX Box PLC Splitters are key components in FTTX networks and responsible to distribute the signal from central office to munbers of premises. It's operating wavelength from 1260nm to 1650nm, the LGX Box PLC Splitter can be utilized in in-ground and aerial pedestals well as rack mount systems. SOPTO provides PLC splitter with LGX box to fit for your special requirements. We also provide variety of Rack Mount PLC Splitters in form of 1U 19" rack mount enclosures. They are also available in the form of wall-mount box with fiber diameter up to 3 mm. The Rack Mount PLC Splitter is suitable for FTTx projects, CATV or data communication centers. SOPTO supplies Rack Mount PLC Splitter that features Low insertion loss, Low PDL, Excellent splitting uniformity, Wide wavelength range, High Reliability and Stability, and Telcordia Compliance. Buy 1U Rack PLC Splitters or other Fiber PLC Splitters from the direct manufacturer to save your money and time. 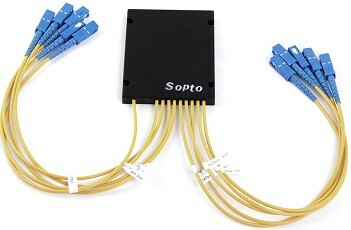 Additionally, Sopto’s single-mode Planar Light ware Circuit Splitter (PLCS) are developed based on unique silica glass waveguide process with reliable precision aligned fiber pigtail in a miniature package, it provides a low cost light distribution solution with small form factor and high reliability. The PLCS devices have high performance in terms of low insertion loss, low PDL high return loss and excellent uniformity over a wide wavelength range from 1260nm to 1620nm and working in temperature from -40C to +85C. The PLCS devices have standard configurations of 1x4, 1x8, 1x16 and 1x32 configurations, as well as customized structures of 2x8, 2x16, 2x32 and 2x64. A Great merchant.I've ordered from them several times.high quality, thanks. Easy to deal with, good communication. I would will buy from them again. What I wanted for a good price and reasonably quick deliver. Hey, great service! Really fast and was in great shape. it works great. It is pretty cheap ,quality is not bad. I checked to make sure that it worked before I ran it, and it worked fine. Great device.Works as advertised! Pretty cool!